The Asian Human Rights Commission (AHRC) has received information from the National NGO Child Rights Coalition and local journalists about children housed in prison in Kokrajhar, Assam. The AHRC is concerned, as such an arrangement is denying children their basic rights. The children are being housed in prison not for any delinquency on their part but due to the detention of their ‘foreign’ mothers. A team from the National NGO Child Rights Coalition (NNCRC), a network of civil society organizations working on child rights, undertook a fact-finding visit on November 4, 2013 to make an enquiry regarding two children lodged in the detention camp in Kokrajhar for the last couple of years. The “detention camp” is nothing but the local prison. The children live there along with their mother. Their father is lodged in another detention camp / prison in another district. The fact finding committee of NNCRC learned that Ms. Ramani Biswas and her husband Mr. Dilip Biswas, of village Kasashila, P.O. Raja Mayang, District Morigaon, Assam, were declared foreigners in 2010 by the Foreigners Tribunal in Assam, as per case no FT (1st) Morigaon FT (C) 151/ 07, FT Case No 137/ 06, WP (C) 4190/ 10. Their eldest daughter, about 8 years old at the time, was also declared a foreigner. Dilip Biswas was lodged in the detention camp at Goalpara district jail and Ramani Biswas, along her two daughters, was transferred to the detention camp at Kokrajhar district jail on October 22, 2010. The youngest daughter was about two and half years old at the time, and was not declared a foreigner by the Tribunal. The two girls in questions have not met their father since their incarceration in Kokrajhar district jail on 22 October 2010. Three years have passed. Their basic rights, such as their right to education, have been denied. The authorities have shown no interest or concern to allow the children to enjoy their rights. The District Child Welfare Committee (CWC) is unable to provide relief to the children; it is virtually non-functional. The NNCRC fact-finding committee has also found other children lodged in the district jail in similar circumstances. Their mothers, having been declared foreigners, have been placed in the prison. These children are innocent Indian citizens. The detention camps in Assam are not separate camps as such. Physically and administratively they are no different from the district prison where they have been instituted. The prison administration follows the Prison Manual, in administering the “detention camps”, i.e. 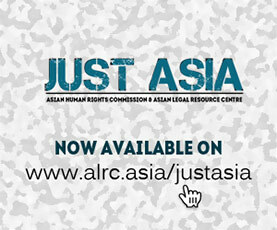 for all purposes those detained in the camps are treated no different to incarcerated criminals and other undertrials. Children incarcerated with their parents in such detention camps eat, live, and share the same space with prison convicts. The fact-finding committee of NNCRC observed that this arrangement provides little opportunity for the holistic development of the children, as the jail is not equipped to provide for the same. To detect foreigners residing illegally in the state of Assam, 36 Foreigner’s Tribunals (FT) are in operation under the Foreigner’s Tribunal Act, 1946. A foreigner is defined as a person who is not a citizen of India. A ‘citizen’ implies that which is defined in sections 3, 4, 5, 6 and 6(a) of the Foreigner’s Act. The AHRC has learned that a majority of the decisions of the FTs are ex-parte; fair representation by the alleged foreigner during the trial is not entertained. There is a large backlog of pending cases. According to a media report (The Sentinel, December 16, 2013) more than 2,37,000 cases are pending in these tribunals, out of which 11,000 cases are already around 19 years old. The 36 functioning FTs can only administer 3,000 cases per year. Lakhs of people in Assam who lack credible citizenship proof or with disputed citizenship are listed as ‘doubtful voters’ (D-voters) by the Election Commission. A D-voter can neither cast nor contest election till their status is cleared by the Foreigner’s Tribunal. Due to the extremely slow pace of the FT proceedings, citizens are denied their voting rights for years. A majority of D-voters in Assam are Bengali-speaking people from the Hindu and Muslim community. Gender wise, a majority of the D-voters are married women. Recently, the government of Assam has declared to clear the citizenship of Hindu D-voters on compassionate grounds, as many of them migrated from Bangladesh fearing persecution there. No such decision has been taken for Muslim D-voters. The Assam government has requested the union government to set up another 64 FTs to speed up tribunal proceedings. Only more inaction has resulted. The state of Assam has three detention camps for lodging persons declared by the FTs as “foreigners”. Foreigners detected by the FTs are lodged in the detention camps / prisons till their appeals are disposed by the higher judiciary or till they are deported. Such persons, accused or convicted as foreigners, are treated like stateless persons and are denied basic rights, like family visits. It is reported that several families are separated due to the tribunal dividing them up into citizens and non-citizens of India. This has created much turmoil in numerous families lives. The AHRC is in possession of a letter from camp detainees dated 1 January 2011 which states that they are Indian citizens and their cases are pending before the Gauhati High Court. However, the bail plea of these detainees has been denied and they are being held in the detention camp. The detainees lament that their absence from home and their lack of income to support the life of their minor children has forced the children to look for odd jobs as domestic help or forced them to beg for their survival. Child rights in India are protected in chapters III and IV of the Indian Constitution, and in special laws like the Juvenile Justice (Care and Protection of Children) Act, 2000; Infant Milk Substitutes, Feeding Bottles and Infant Foods (Regulation of Production, Supply and Distribution) Act, 1992; Pre-natal Diagnostic Techniques (Regulation and Prevention of Misuse) Act, 1994; and Persons with Disabilities (Equal Opportunities, Protection of Rights and Full Participation) Act, 1995. Furthermore, India is a state party to the International Convention on Child Rights and has undertaken elaborated obligation to protect child rights. A child in India is entitled to several fundamental rights. Article 21A of the Constitution, created as a result of the 86th Amendment, declares free education for all children between the ages of six to fourteen years a fundamental right. Rights enshrined in Article 21 of the Constitution also protect children. Article 21 states that no person shall be deprived of life or personal liberty except according to procedure established by law. In addition, certain directive principles of state policy are relevant to children. Article 39(f) directs the state to ensure that children are given opportunities and facilities to develop in a healthy manner and in conditions of freedom and dignity and that children and youth are protected against exploitation and moral and material abandonment. And, Article 45 of the Constitution stipulates that the state shall endeavour to provide early childhood care and education for all children until they complete the age of six years. The interests of the child have been given priority in legal safeguards and in related policies in India. A child that is not delinquent being held in prison amounts to a violation of legal and constitutional provisions. A child’s right to life and personal liberty cannot be compromised and cannot be restricted as if the child were a criminal. The children living with their mother in a prison should not be treated as a under-trial or convict. They should be provided with food, clothing, separate utensils, adequate sleeping facilities and other necessary facilities required for healthy development of a child. Children up to the age of six can be with their mother and then they should be handed over to a surrogate, if the mother wishes so, or to an institution maintained by the Social Welfare Department. Children are also entitled to medical care and vaccination. The prison house must arrange the same for the children. Children must be provided with adequate educational and recreational facilities. Children housed in detention camps / prisons in Assam are being denied their rights, despite protections in law, in the constitution, and a notable Supreme Court judgment. In the case enquired into by the NNCRC fact-finding team, the parents and one daughter have been declared ‘foreigners’ and are awaiting final verdict on their citizenship, while the younger daughter is an Indian citizen entitled to her constitutional rights. The fate of the child with Indian citizenship is uncertain. If her parents and her elder sister are confirmed foreigners by the FT, would this mean the child would have to suffer separation from her mother too, having already suffered incarceration and separation from her father? It is regrettable that the family has been separated for years now; the children have been deprived of their father’s love and care. Even in custody, the family is entitled to their rights until the disposal of their case. The AHRC urges the authorities to ensure constitutional and legal entitlements of the children and implement the guidelines framed by the Supreme Court in R D Upadhyaya vs. State of Andhra Pradesh, [2006 (4) SCALE 336]. Early disposal of the cases pending before the FTs are in dire need for the best interest of such children.